Food of the Year, Quinoa! 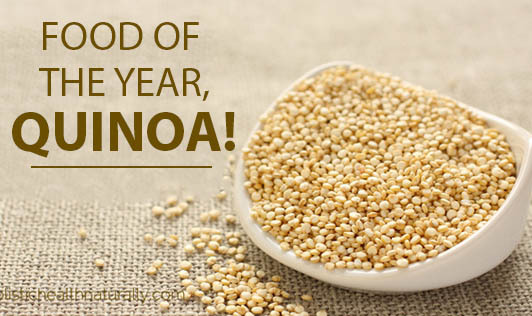 United nations has declared ‘Quinoa' as the healthiest food of the year 2013! Quinoa (pronounced keen-wah) is a grain like seed with a lot of health benefits. It is known as a ‘pseudo cereal' and not considered in the family of cereal grains. This crop is closely related to beetroots, spinach and tumble weed. It is called Bathua in Hindi. Many awareness programs are conducted by FAO to promote the health benefits of this grain. Due to its rich nutrition profile, it is being used as a major food to curb malnutrition in many countries. Quinoa is also a super food for weight watchers due do its low carbohydrate and high protein content. A serving of cooked quinoa gives five grams of fiber and eight grams of protein! According to the studies conducted by FAO, quinoa is the only food that contains all the essential amino acids, vitamins and minerals. And it is gluten free! So it is a good and healthy option for people with gluten sensitivity. It is the similar to cooking rice two parts water and one part quinoa! It can then be replaced to rice, pasta or noodles. Some more tips to include quinoa in your diet. • Mix nuts and fruits to cooked quinoa and eat it as your breakfast porridge. • Sprouted quinoa can be used in salads or curries. • Add them to your vegetable soups. • You can even add green gram or red gram and make your khichdi with your own recipe. Quinoa, being packed with wholesome nutrients, is here to stay!